Now that I am in the frigid part of Europe – Nuremberg Germany – I have some time to pen some more reviews. 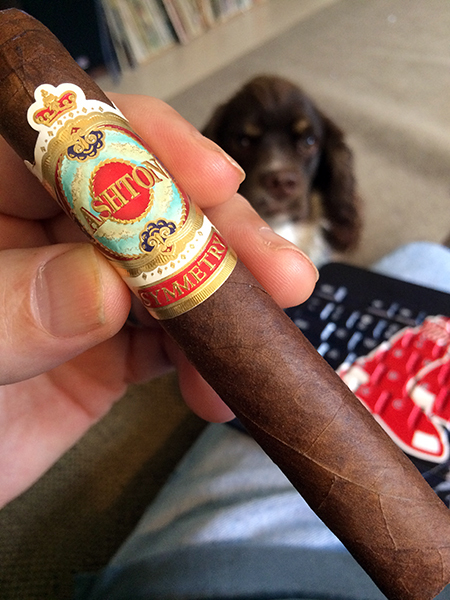 Today I would like to discuss the Ashton Symmetry which my good friends from Famous Smoke Shop sent me last month. I have enjoyed this cigar in both the Robusto and Sublime vitolas and find it to be quite a pleasurable smoke. The cigar is made by Arturo Fuente and is blended with tobaccos from their farms in the Dominican Republic and Nicaragua and wrapped in a beautiful Ecuadorian Habano leaf. To start off, the Symmetry had an earthy and toasty aroma along the barrel and foot. Quite inviting to say the least. The wrapper is a rich brown color with just a smidgen of noticeable veins. After slicing the cap the cold draw offers red pepper, spice, and cocoa notes. The pepper lingers on the lips prior to lighting it up. Once ignited, the Symmetry engine is exhausting some heady pepper in the initial puffs hitting the back of the palate as spice and coffee fills out the early profile. The spice has a long finish on the palate while the burn is solid with a tight light grey ash that rests on a pinpoint burn line. As I write this,from the notes I took early back in the Stogie Press lounge, I am sitting in the Casa Del Habanos lounge in Nuremburg Germany enjoying some 25 year Zacapa Rum and some verboten fruit – a Habanos Punch. Though I bring my Dominican and Nicaragua stash with me when I travel, I still enjoy the little taste of Cuba while I am here. Cuban cigars are wonderful but not as over the top as many would think. They have a distinctive flavor just like Nicaraguan and Dominicam puros have their flavor. Perhaps someday we will have the pleasure of experiencing blending with Cuban leaf and even more flavor sensations will open up. Well, the Symmetry certainly opened up nicely, with a full body of smoke. There is a raisin note that enters after the first third and as it moves into the second third the raisin starts to morph into a delicious cherry with a smoke that has smoothed out nicely. At this point I would say this is a delirious cigar even if there were no more transitions. I can only imagine how well the Symmetry would pair with this fine Zacapa rum I am sipping. Getting well into the second third, the cherry takes front and center as the spice has faded and then to my delight a hint of spearmint enters along with an enticing fruit aroma. Ah yes! Yummy lip smacking flavor! 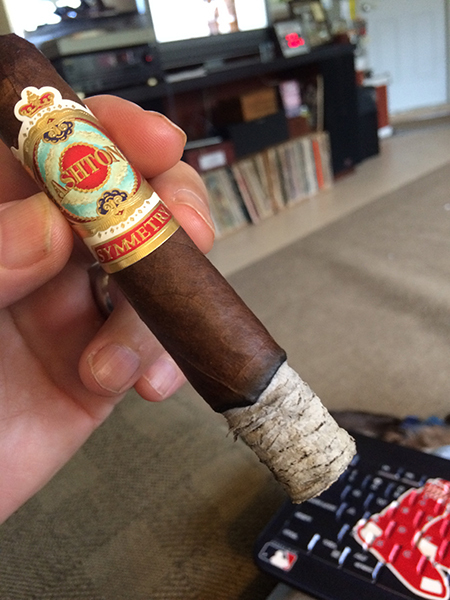 The ash is as amazing as the flavor on this cigar holding tight all the way to tip of the band before falling. I have to say I have smoked a lot of Cuban cigars while here and many dont have such a fine ash. The final third brings back the spice evident in the first third. Although the Robusto is quite nice, the experience ended too quickly and I found myself igniting another. 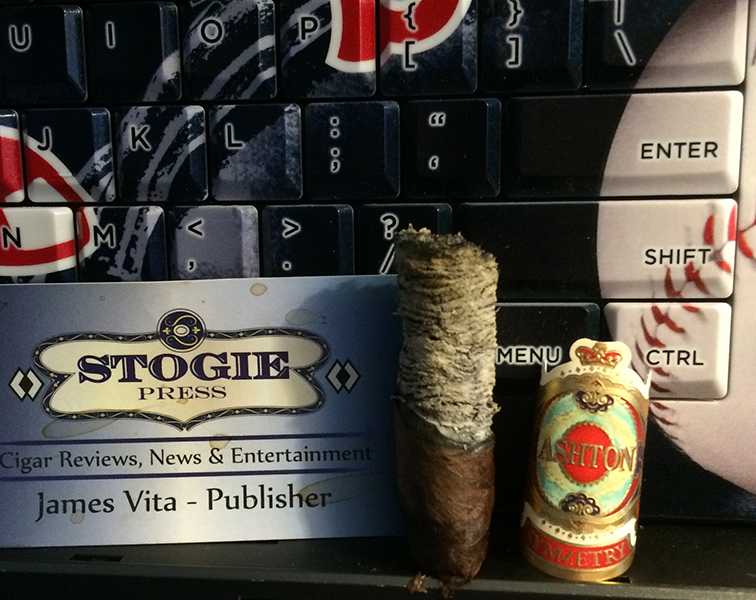 The larger Sublime vitola was, in my mind, just the right size which I picked up and enjoyed at Don Yeyo cigars in Dearborn MI – a local favorite of mine. Overall, the Symmetry is a medium strength cigar that many will enjoy. Though not overly complex it had delightful transitions that kept the palate intrigued. If you cant find these at your local retailerm you can order them from Famous Smoke here. 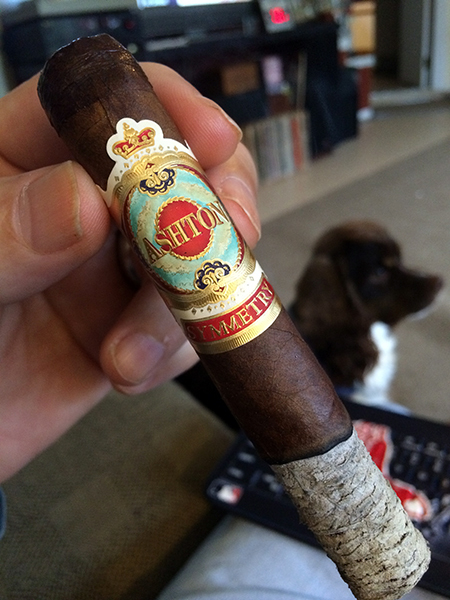 This entry was posted in Ashton, Cigar Review and tagged Ashton Cigars, Casa Del Habanos, Don Yeyo Cigars, Famous Smoke Shop, Nuremberg, Symmetry. Bookmark the permalink.